Johnson's California, with Territories of Utah, Nevada, Colorado, New Mexico and Arizona. 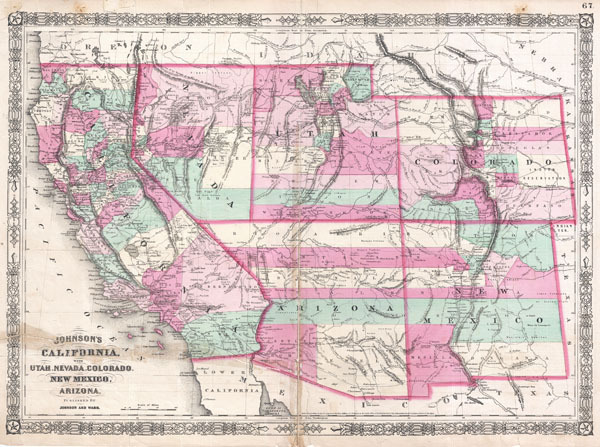 This is Johnson and Ward's 1864 map of the American southwest. Depicts the state of California and the territories of Nevada, Utah, Colorado, Arizona and New Mexico. Offers superb detail noting mining districts, emigrant trails, the Santa Fe Trail, the Pony Express Route and several proposed railroads as well as American Indian tribes, geological features, and local political divisions. Features the fretwork border common to Johnson's atlas work from 1864 to 1869. This important map went through several different states during its publication period from 1860 to 1870. This critical period in westward expansion saw incredible development and change throughout the region. Collecting the various states of this map has become something of a sub-genre for southwestern map aficionados. Johnson updated the plates for this map annually and sometimes even issued multiple variants the course of a single year. This, the 1864 Johnson and Ward version represents a complete re-engraving of the 1862-1863 map. Johnson added considerable detail in the mountainous regions of California, Nevada and Colorado. Arizona and New Mexico appear as independent territories but adhere to the old 'New Mexico' county structure. The southern boundary of Nevada with Arizona is set at 37 degrees of Latitude such that Las Vegas, which is noted, rests firmly within Arizona. The Utah-Nevada Border is set at 115 degrees of Longitude, roughly one degree further west than it is today. Steel plate engraving prepared by A. J. Johnson for publication as plate no. 67 in the 1864 edition of his New Illustrated Atlas… This is the last edition of the Johnson's Atlas to bear the Johnson and Ward imprint. Johnson's New Illustrated Family Atlas, 1864 Johnson & Ward Edition. Johnson's New Illustrated Family Atlas was produced in numerous editions from about 1860 to 1887. Johnson's first atlas was mostly likely the 1859 edition of Colton's General Atlas which both aesthetically and comprehensively very similar to the 1860 first edition of the New Illustrated Family Atlas. Johnson's atlas was noteworthy in its day as one of the few commercially produced American atlases that could compete with more established European Atlases. Although he called the atlas 'Steel Plate' on the title page for marketing purposes, Johnson in fact incorporated modern lithographic printing techniques and lower quality woven wood pulp paper to economically produce large format maps in quantity. He also began publishing the New Illustrated Family Atlas on the cusp of the American Civil War, a decision that proved fortuitous, as the war corresponded to a general increased interested in cartography. For the most part, Johnson's Atlas was sold by subscription; nonetheless it became so popular that for at time he was considered the largest publisher in the world. Other than the first edition, the atlas itself has no true editions. Rather, Johnson incorporated updated maps as they became available, so each example of the Johnson atlas might well contain unexpected and scarce individual maps. Johnson's map of the American Southwest, for example, appeared in more than 17 different states, each illustrating minor variations to the rapidly chasing geography of that region. Moreover, Johnson's offered a service whereby he would mail updated map pages that could be tipped into older atlases to keep them current. Generally speaking, Johnson's atlas was issued in four periods - each defined by a distinctive decorative border. The earliest edition featured a strapwork border that appears as rolled and decoratively cut leather. This borderwork remained in use until 1863. In 1864 Johnson started using an updated fretwork or grillwork border that resembles worked iron - as in a decorative fence. This border was in use from 1863 to 1869. The 1863 edition of Johnson's atlas used both borders and is considered transitional. From 1870 to 1882, Johnson introduced a new border that featured elaborate Spirograph style geometric designs, which was used from 1870 to 1882. After 1880 a new border different but aesthetically similar to the Spirograph border began appearing. Certain editions of the atlas issued from 1880 - 1882 were transitional. Average condition. This map has a few issues including an old centerfold repair and a old verso repair extending from the left margin through title area. Price discounted accordingly.